When I first came to Northfield as a boy in 1886 and attended services in St. John’s Church — then located on the east side — I remember well there was a choir that sang quite regularly at Sunday morning services. The director was a well-known businessman of the city, Mr. H. A. Boe, and the singers were mostly elderly members of the congregation. At that time the Norwegian language was used exclusively at all services. The choir’s repertoire was therefore limited, as suitable choral music in Norwegian was difficult to obtain. When Mr. Boe retired, one of the St. Olaf students who had had some experience with choir work was asked to take his place and continued as director for some years. When in the summer of 1902, after an absence of eleven years, I returned to Northfield to join the faculty at St. Olaf, Mrs. Schmidt and I both joined the choir in St. John’s Church and continued as members for many years. The St. Olaf student who directed the singing at Sunday services graduated from college in 1907 and a new director had to be found. The unanimous choice of the choir members was Professor Christiansen and when he was interviewed he gladly accepted. Soon after he became director, Mr. Christiansen and I quite often conferred about the possibility and advisability of making some rather drastic changes for the choir’s improvement. We both felt that, with so much youthful material available at the college, a larger organization of college students could render the congregation better service, and at the same time stimulate greater interest in our Lutheran choral heritage. President J. N. Kildahl, who then also was pastor of St. John’s, concurred and gave wholehearted support. The personnel of the choir therefore gradually changed, and instead of a small group of 15 elderly people, the organization included in its membership 50 young singers, who, under Mr. Christiansen’s magnetic direction, soon gained a reputation as a superb singing group, both locally and in nearby communities. The repertoire also changed materially. Mr. Christiansen added many choral numbers with which he had become familiar when he had studied in Leipzig, Germany, where he came much in contact with the wonderful work of Gustav Schreck, director of the famous Bach choir of St. Thomas Cathedral. There is no doubt that Mr. Christiansen was profoundly influenced by this great musician and by his choir. Although it was difficult for us to get choral music from Germany, some numbers were available for the choir’s use. Mr. Christiansen also added some of his own compositions and arrangements. Requests began to come from our congregations in Kenyon, Holden, Zumbrota, and other nearby places to bring the choir out to them so that they might have an opportunity to hear the inspiring rendition of hymns and chorales. Trips to their congregations were undertaken from time to time. Quite often, too, when I was out arranging concerts for the band, people would ask me: “Why don’t you take St. John’s choir out? Our church people like to hear the band, that is true; but they would be very grateful if they could also hear that choir in sacred concert.” It was therefore decided I should try to arrange a trip for the choir during the Easter recess in 1912. Madison, Stoughton, and Milwaukee, in Wisconsin, Chicago and Ottawa in Illinois, were some of the cities visited. Concerts were given in churches on a collection basis and choir members were housed in private homes. Concerts on that first tour were in the nature of a song service. President Kildahl accompanied the choir and after a few numbers had been sung, he gave a sermonette stressing thoughts brought out in the choir songs. There were three groups of songs and two meditations. The success of the first trip afield was so pronounced that a second one was undertaken that same year after the close of college in June. This time the itinerary included cities in the northwestern part of Minnesota and eastern North Dakota. The annual meeting of the synod was to be held in Fargo that year and two leading churchmen from Norway were to be there as visitors and guests. 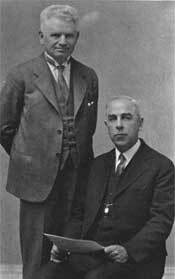 They were Bishops Böckman and Hans Nielson Hauge. The choir tour in June was therefore arranged so as to bring the singers to Fargo while the convention was in session. The choir sang at a number of meetings. Both Bishops from Norway were much impressed, and when asked how the choir would be received in Norway, both said emphatically that such a tour would be most desirable, and the church people of Norway would be very grateful if the choir could come. Mr. Christiansen and I had sometimes toyed with the idea of taking the choir to Scandinavia, but how to finance such an expensive undertaking was a problem indeed. The favorable comments of the visiting bishop from Norway encouraged us and we began to think very seriously of a tour in 1913. Some concerts could be given in this country on the way to New York, but income from these would be small as the choir was not known in eastern cities and sacred concerts were rarely given except on a free admission or collection basis. Finally it was decided that I should try to get financial backing from a few individuals who would then be recognized as sponsors or guarantors of the tour. Thirteen men agreed to become guarantors, but only a few of these actually gave financial aid; income from choir concerts during the two years after the return from Norway was sufficient to pay back whatever deficit had been incurred. 1. Membership in the choir should be limited to 50 singers, to be selected by the director. 2. Rev. Th. H. Haugan, pastor of St. John’s Church, was to accompany the choir as the official speaker on all occasions. 3. J. Jörgen Thompson, who had won a scholarship for a year’s study in Norway in 1910 was to arrange the concert tour in that country. 4. Women members of the choir were to appear at concerts in uniformly designed white satin dresses and long kid gloves. The men were to wear full evening dress. 5. The program was to consist of choral anthems by the entire choir and a few hymn arrangements sung by a women’s quartet. There was to be no speaking during the concerts as had been the case on the first concert trips in 1912. 6. I was to arrange the trip to New York with as many concert stops as possible; also transatlantic passage on theChristianiafjord, the first boat of the Norwegian-America Line. Mr. Thompson was very well qualified to undertake the important task of arranging concerts in Norway. He was a student member of the band that toured the country in 1906 and during the school year 1909-1910 was a graduate student at the university in Christiania. He also had had experience as manager, for in the summer of 1908 he had arranged a series of concerts through Iowa, Minnesota, and the Dakotas for an octet of choir members which Dr. Christiansen directed. It was fortunate for the choir, therefore, that he was available and that he was willing to assume this difficult assignment. Mr. Thompson went to Norway early in the spring of 1913 to begin the work over there. It was necessary for him first of all to obtain the consent of the department of Religion and Education of the Norwegian government for the use of churches and school buildings in the different cities. This having been granted, he visited each of the places where he thought the most successful stops could be made and completed detailed arrangements for concerts as well as for the housing and entertainment of the choir members. The same travel plan that was found to be so satisfactory in 1906 was used in 1913 for the choir. A few concerts were first to be given in and near Christiania, then a trip was to be made to Gjövik, Hamar, Lillehammer, and Trondhjem where a beautiful coast boat, the LYRA, was chartered for the trip along the coast back to southern Norway. This coast trip southward would include concert stops in practically all the larger and more important coast cities. The arrival of our ocean liner in Christiania was an event of general historic interest as well as of special interest to those who were welcoming the choir. 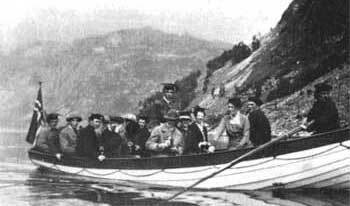 Our boat, the Christiania-Fjord, was the first liner of the newly established Norwegian-America steamship line and this was the first trip of that new liner from America to Norway. No wonder a tremendous crowd was at the pier to see the arrival of this new boat and to welcome the Americans. The reception at the landing and later in the city was an unforgettable occasion. The first concert by the choir, given in the University auditorium, was completely sold out; the aisles were packed with people and thousands were gathered in the streets outside that had not been able to get tickets. The King and the Queen were present. On one of the evenings of the stay in Christiania the Choir was entertained at a magnificent banquet at Holmenkollen. A great many members of the Norwegian Cabinet were present as well as many of the University faculty members and city elite. You all must come up to Kongsberg and hold a concert. Every family in these town have sons and daughters and grandparents scattered all over your land of fridom. Make notice in good time and you will see a great deal of de most beautiful in Norway, of people, silver, guns, water, and mountains. Be sure to come! A stop of special interest was the one in Lillehammer where the choir had time to visit the famous Maihaugen museum, a collection of old original buildings and contents that had been brought from valleys in the mountains and placed in a beautiful park on one of the hills near the city. Each building and its contents was of historic interest as it represented a home in the valley community as it was in the olden days. There was a building which had been the parsonage, in which the furniture, kitchen utensils and ornaments were such as were found in the pastor’s home. Another building had been the home of an ordinary farmer; still another that of a town official. Of great interest was the quaint old church with its pews, altar and decorations. Members of the choir enjoyed very much going from building to building and cameras were in constant use. In front of the old church were stocks for the punishment of those guilty of minor offenses. These consisted of a post to which the offender was tied with a halter securely fastened about his neck. The guilty one would have to stand there, we were told, to be taunted by the good people as they passed him on their way to church. 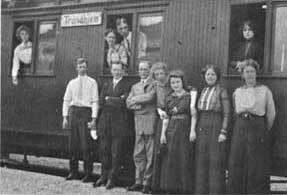 The choir’s arrival in Trondhjem was quite different from that of the band in 1906. Advance notices had appeared in the daily papers warning the people not to make the mistake that had been made in 1906 when no one, not even members of the local committee, had come to the depot to welcome the visitors. As a result, in spite of rainy weather, a very large crowd was present to greet the choir when they arrived. A local mens’ chorus of one hundred fifty members carrying flags and wearing the well-known singers’ cap, sang songs of welcome; and a local band played marches and the national anthems. Everything possible was done to make every moment of their stay in the city as pleasant as possible. 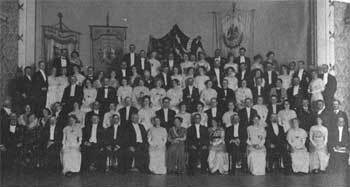 In the evening, after the concert, the Anglo-American Club of Trondhjem entertained at a magnificent banquet. At Trondhjem the boat Lyra awaited us. We lived on the Lyra just two weeks and it proved to be a most enjoyable way to travel as the inconvenience of daily transfer of luggage was reduced to a minimum. Berths on this boat were very comfortable and the meals exceptionally fine. The daily routine was something like this: After each evening concert, the singers were usually given an hour or two for relaxation and leisure; but when the boat’s whistle was heard, all were obliged to come abroad to be checked in. The Lyra would then start out for the next concert stop. As a rule the distance from one city to the next was not great, so that the boat did not travel very fast. It was wonderful to sleep out at sea night after night. The trips were so timed that the arrival in each place would come at about ten o’clock in the morning; and when the boat was still some distance from the landing pier, our captain would set off small bombs which exploded in the water with a deafening detonation. Tremendous crowds were always on hand to bid the singers welcome; and there always were welcoming festivities, with speeches by prominent local men and music by various organizations. There were banquets and receptions in almost every city and our choir members were really fortunate if they were able to get in a few hours of window shopping. The reception in all of the cities was beyond all expectations. 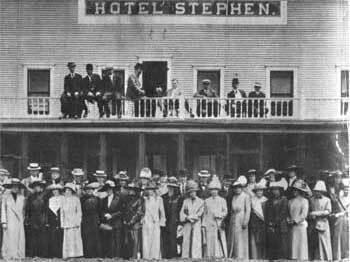 Great crowds were always present at each arrival to bid the visitors welcome; then followed dinners and banquets with speeches and gift presentations. The tour from beginning to end was a never-to-be-forgotten experience for the choir members. His talks at the elaborate banquets at Holmenkollen and in Trondhjem, as well as his more informal talks at concerts and dinners, were always well received. The choir members, too, appreciated his presentations very much and were sincerely grateful to him for what his daily presence meant to them all. Throughout the tour there were thrills without number, but only a few can be related. In one of the coast cities, Haugesund, the choir sang to an audience of about 2,000. This taxed the capacity of the auditorium to the utmost. Many times that number of people had come from the mountain valleys and neighboring coast cities who were unable to get in. After the concert a vast throng followed the choir down to the wharf where the chartered boat was moored. Here in the open square people gathered by the thousand and stood in silence waiting and watching for a chance to see and perhaps also to hear the choir. It was estimated that more than 10,000 people had gathered, for the most part just common peasant and fisher folk who had not been able to purchase tickets in the city. Finally, a temporary director’s stand was set up on the boat’s forward deck, the choir members were called from their state rooms, and in the midnight stillness the choir began to sing to the hearts of these people some of the hymns and melodies known to them all, but sung as I am sure they had never heard them sung before. To be privileged to take part in the singing of those half-dozen songs under such circumstances was a thrill never to be forgotten. intermission, and when we finished, the goats, that had now come all the way down were gathered just outside the window which we had removed, gave a veritable concert of their own. Their intonation was something to hear. During the intermission choir boys in evening dress could be seen chasing these pesky critters up the mountain and that too was quite an attraction. The program which the choir sang on this 1913 tour differs in some respects from those sung by the choir in more recent years. The one sung in Copenhagen is typical of those given on the entire tour.